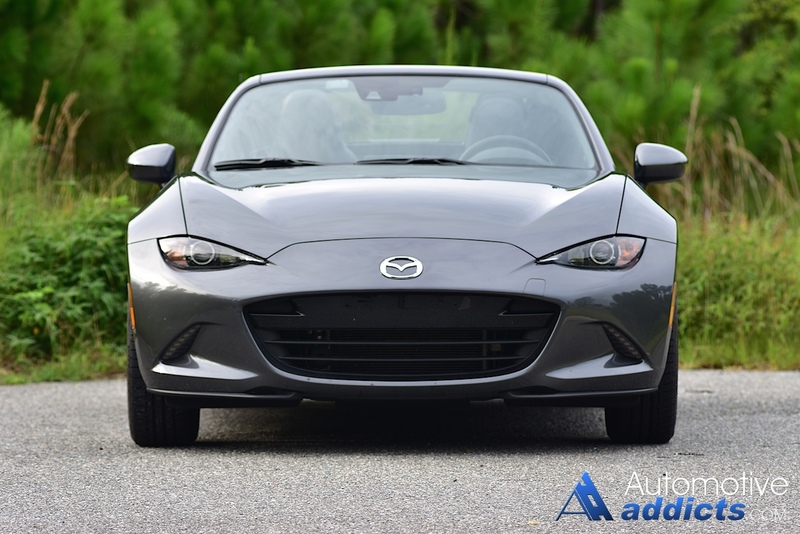 Joining the lineup for one of the most enjoyed road-legal vehicles that you often find at local raceways and autocross events is a new Mazda Miata MX-5 RF. 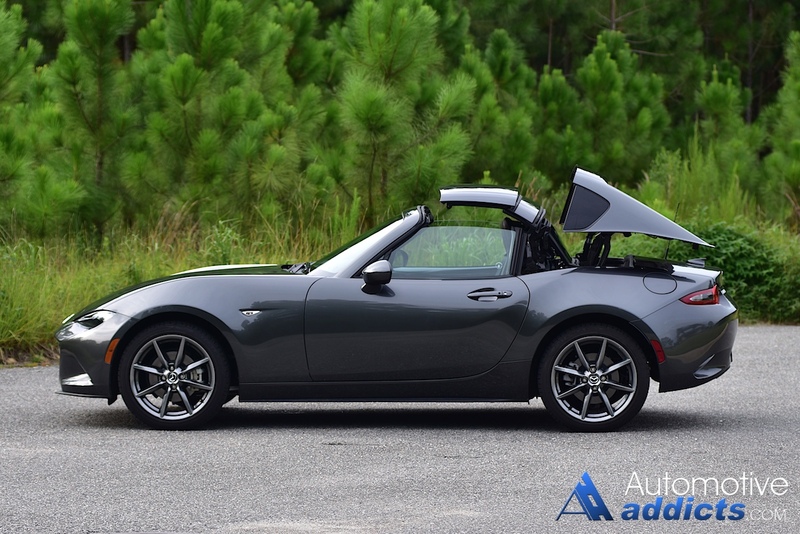 The RF stands for Retractable Fastback, which adds a new power-folding hard top roof to what is otherwise in a manually opened or closed soft-top roadster form for the new Miata. 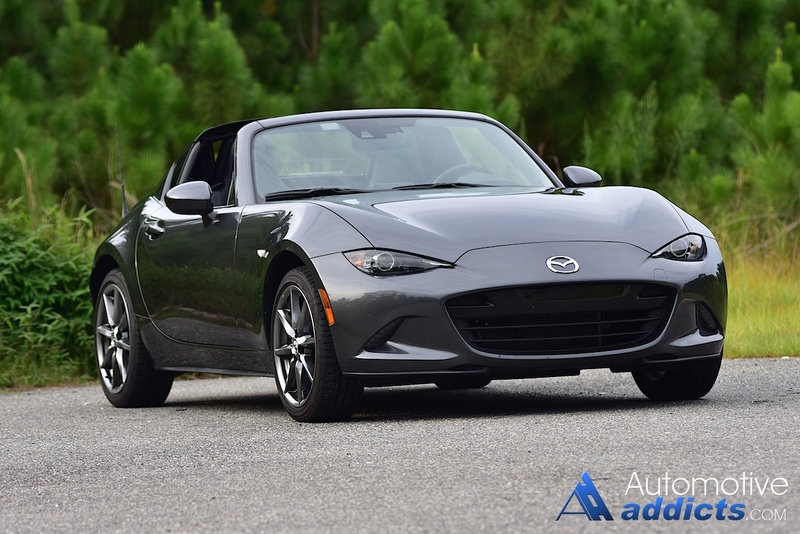 Offering something different for the 2017 model year, the Miata MX-5 RF retains its nimble drivability and only improves upon the formula for somewhat of a quieter cabin and more roadster-forming looks with a smallish opening that is at the expense of just over 100 pounds of added curb weight. The power-folding hard top can open or close in about 14 seconds and can be operated with the vehicle creeping along up to 6 mph. 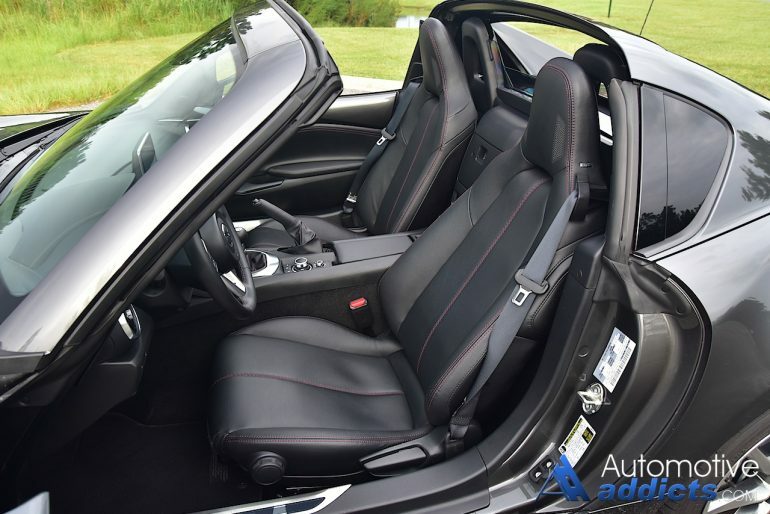 With the top down, the roaster looks compromise the full open-air experience that normal MX-5 Miata owners have adorned since is conception. 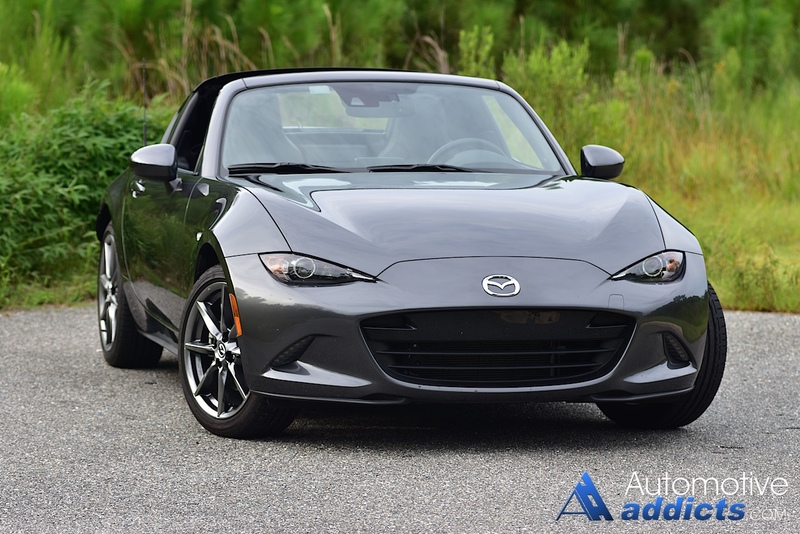 Though, I would beg to think that the RF is a better-looking drop-top and one I would prefer over the full convertible due to my personal disdain for soft-top convertible vehicles. 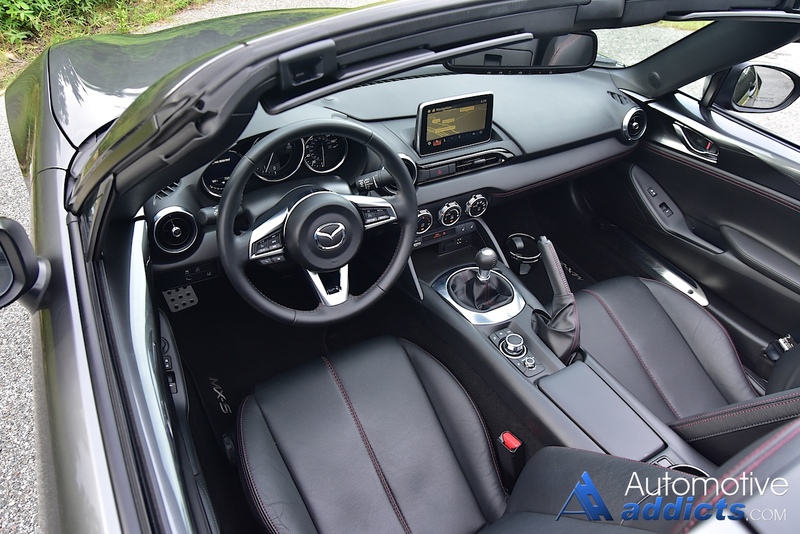 The same driving experience can be had in the new MX-5 Miata RF as one in a new MX-5 convertible. 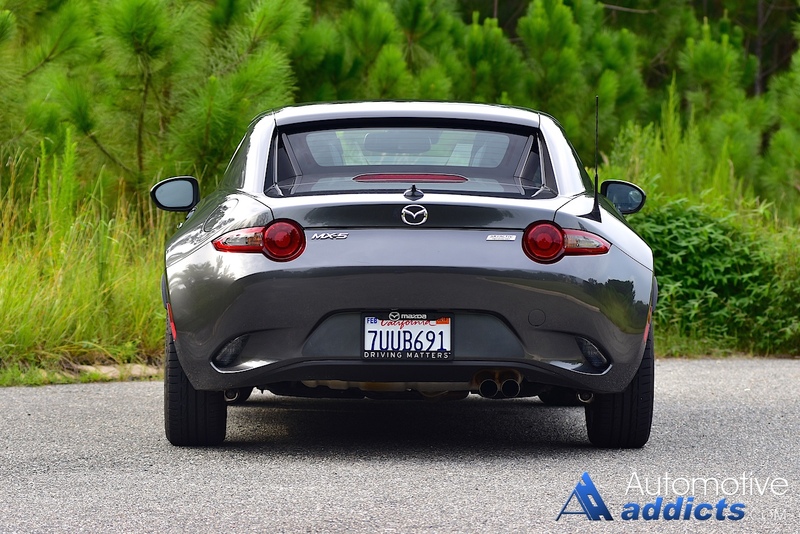 Overall, performance doesn’t seem to suffer much due to the added weight of the power hard top. 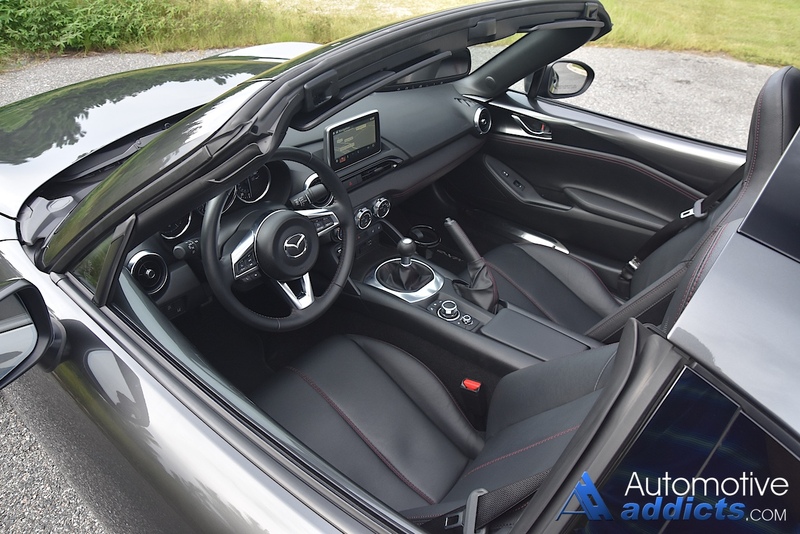 The same rigid feel of the MX-5 convertible is felt throughout the chassis, and the balance appears to remain nearly perfect for those times when you want to break the rear end out and allow the limited-slip differential to do its job keeping both wheels spinning at your beckon. 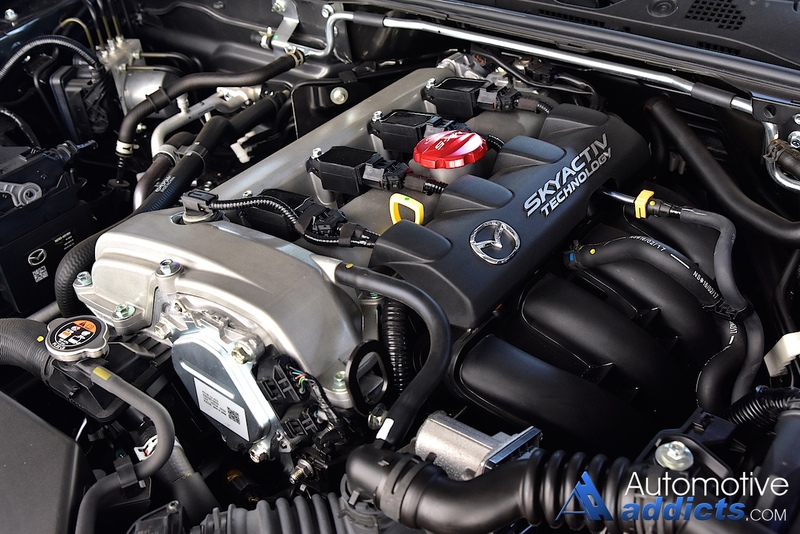 Performing the rear wheel spinning duties is the 2.0-liter 4-cylinder SkyActiv engine producing 155 horsepower and 148 lb-ft of torque. 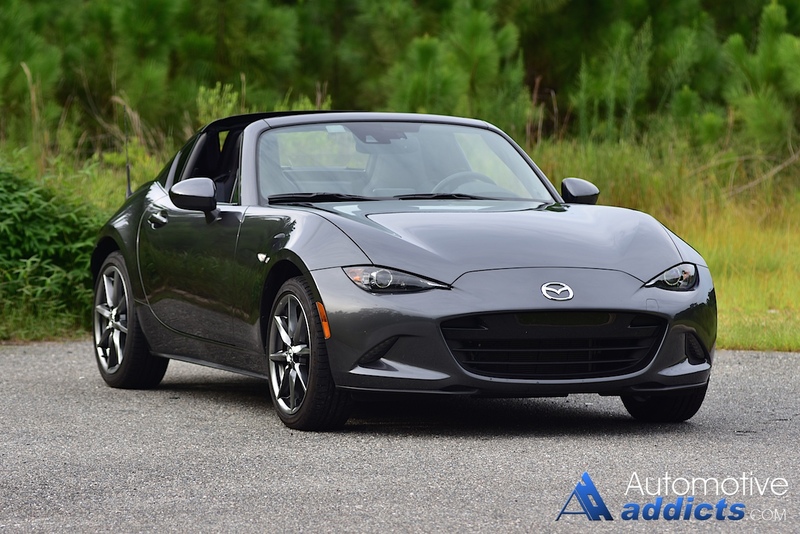 Mated to a 6-speed manual transmission, the only way I would prefer the Miata, the MX-5 is zippy enough to have fun and some. 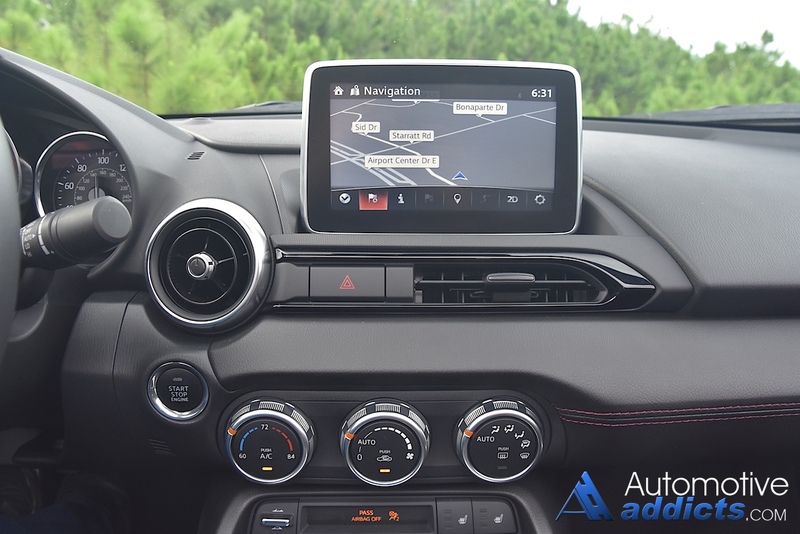 The constancy of the power delivery and welcoming nature to drive the MX-5 harder is all part of the excitement of such a small stature vehicle. Surprisingly, the Mazda Miata MX-5 RF exhibits all that I have praised in my previous reviews of the new 4th generation Miata with the joys of having a power-folding hard top. 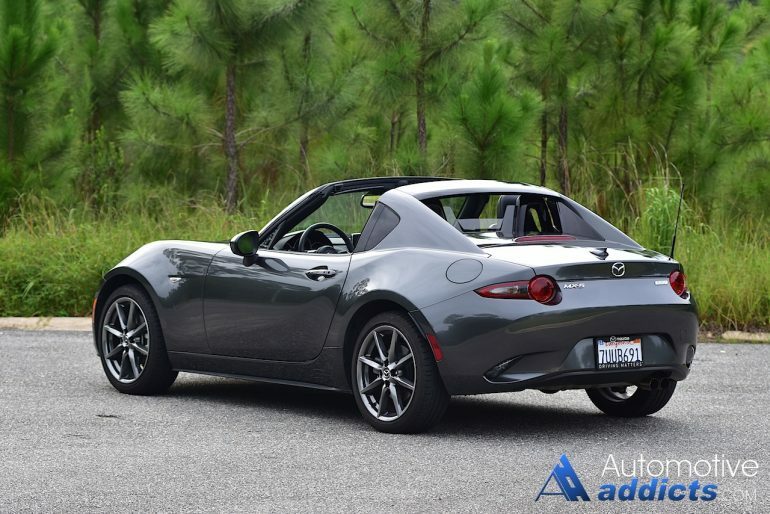 Even the suspension is retuned in the RF to compensate for the added weight of the power hard top. 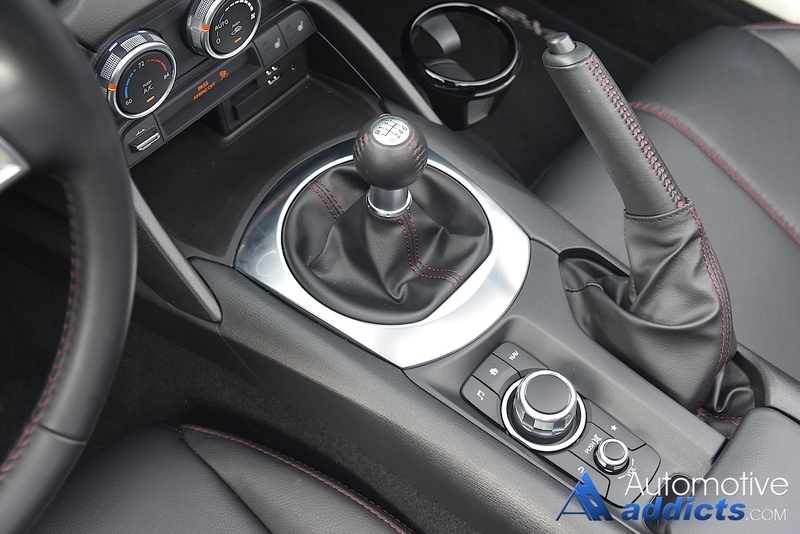 Regarding trim levels, the new MX-5 RF can be had in either the Club or Touring trim with the remarkable 6-speed manual transmission or the direct feeling 6-speed automatic. 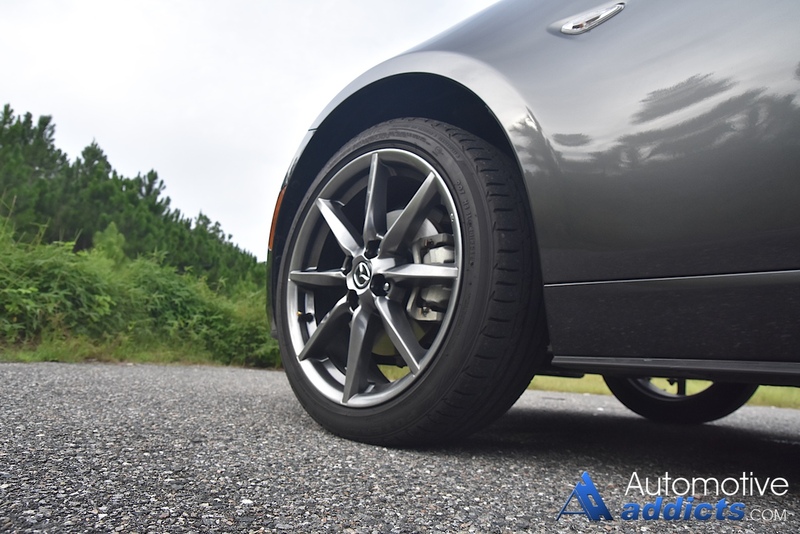 My test vehicle being equipped with the 6-speed manual was a welcomed addition to my garage for the week with hundreds of exciting miles spent in the confines of a smallish but functional cabin. 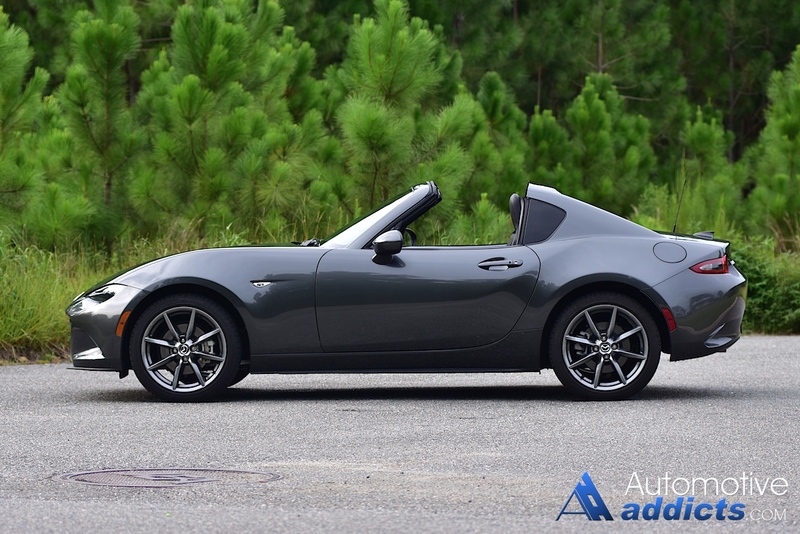 Me, being a rather larger person than normal at 6-feet 3-inches, the Miata MX-5 RF was not my choice for traveling to neighboring cities. Though, the wise use of a small space allowed me to fit perfectly into the driver’s seat, even if I didn’t have much room to “move” around. 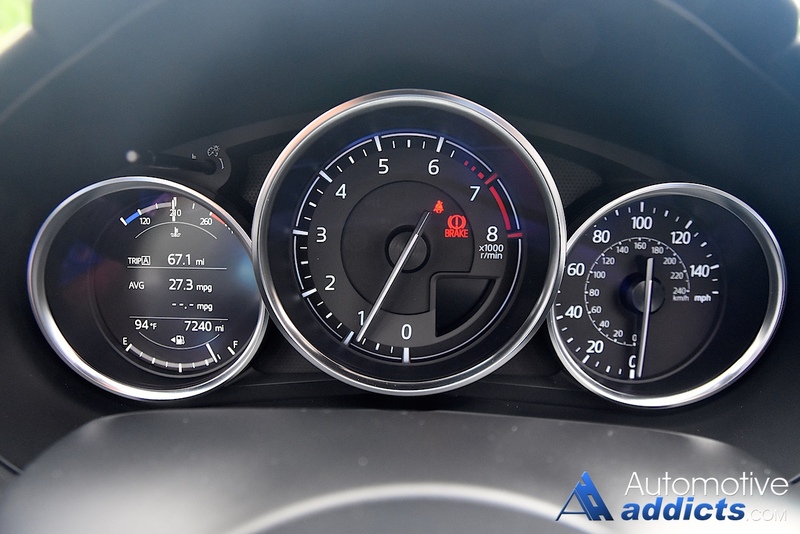 My knees come right up to the dashboard with only an inch to spare, just enough to move my left leg for the clutch. Moreover, the RF appears to slightly cut down on headroom, which was also a close call for my tall stature but proved to give me just enough room. Wearing a helmet with the top up is out of the question. 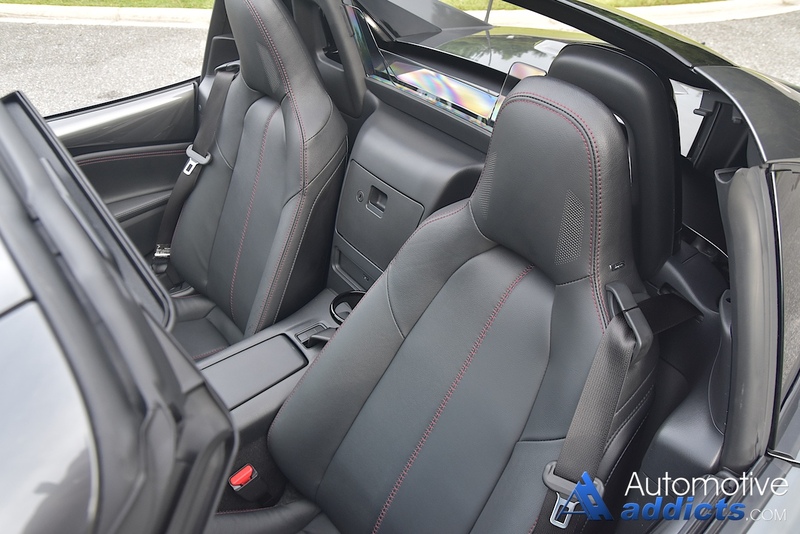 The premium feel and execution of the interior appeals to enthusiasts as to never overly cheapen the cabin. 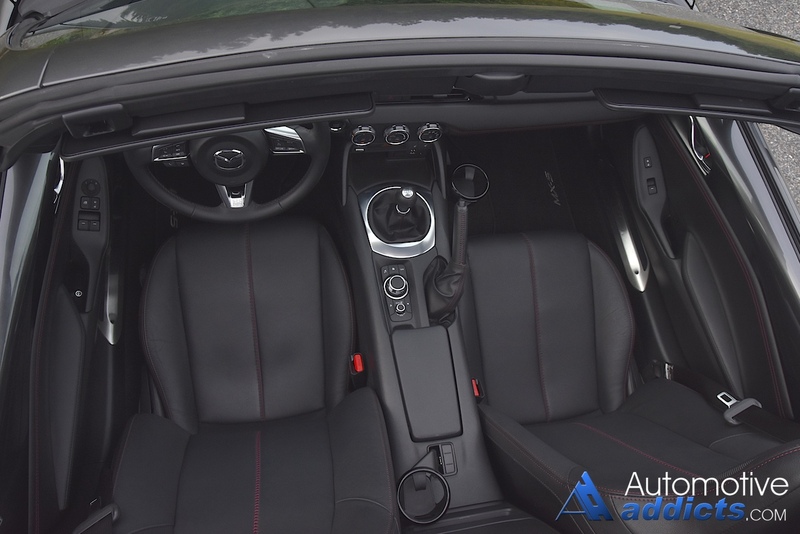 Mazda has been known to cleverly design their new interiors to be attractive and inviting, and the latest MX-5 Miata RF is more evidence of such a task. 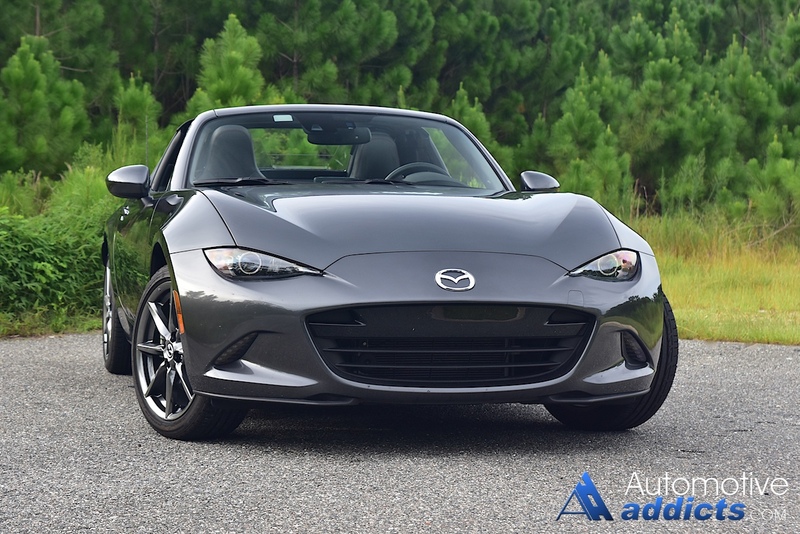 The compromises that come with the choice of the MX-5 RF over the soft-top convertible variations, apart from the added curb weight, less of an open-air experience, and slightly less headroom with the top up, is the fuel efficiency getting one mpg less and a higher price tag. 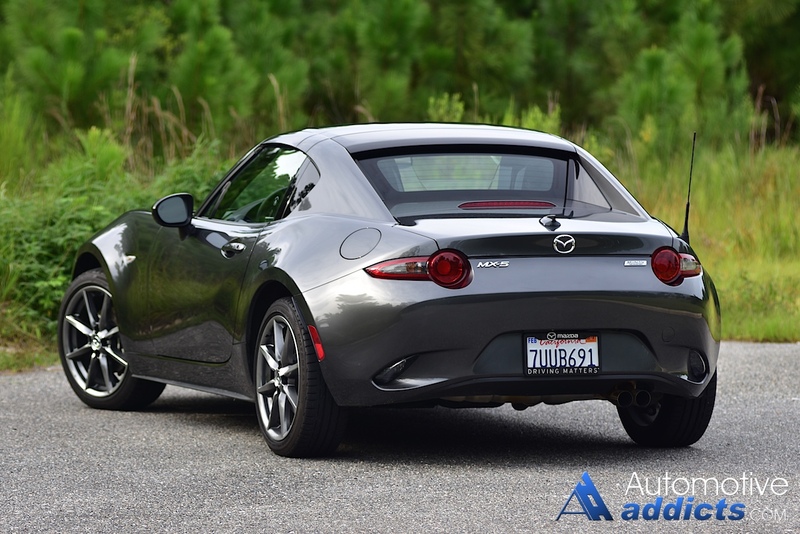 My 2017 Mazda MX-5 RF nails the EPA estimated fuel economy numbers of 26 mpg city, 33 mpg highway, and 29 mpg combined. 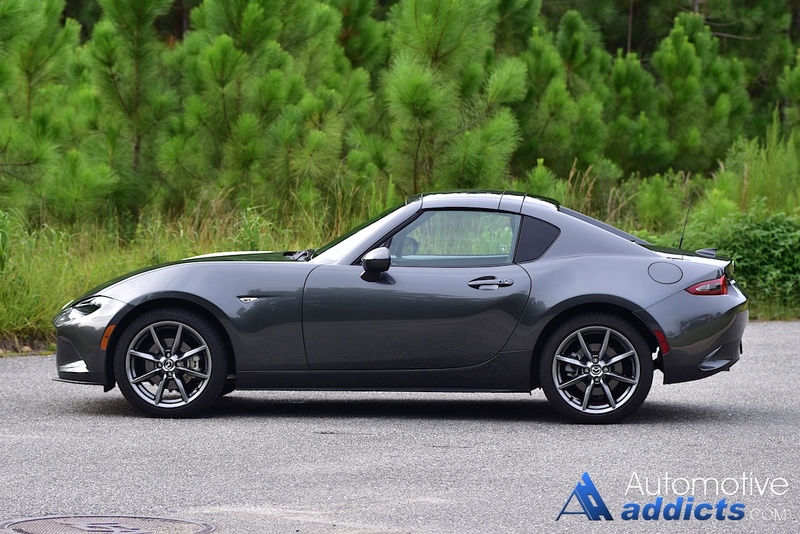 Pricing for the new Miata MX-5 RF comes in at $34,310 for my loaded up Grand Touring trim test vehicle. Now, the question those in the market for the Miata must ask themselves, is the couple of grand premium worth it to have an enthusiast-derived roadster with a power hard top over the manual soft top worth it? I would think so because there’s nothing else out there like it. 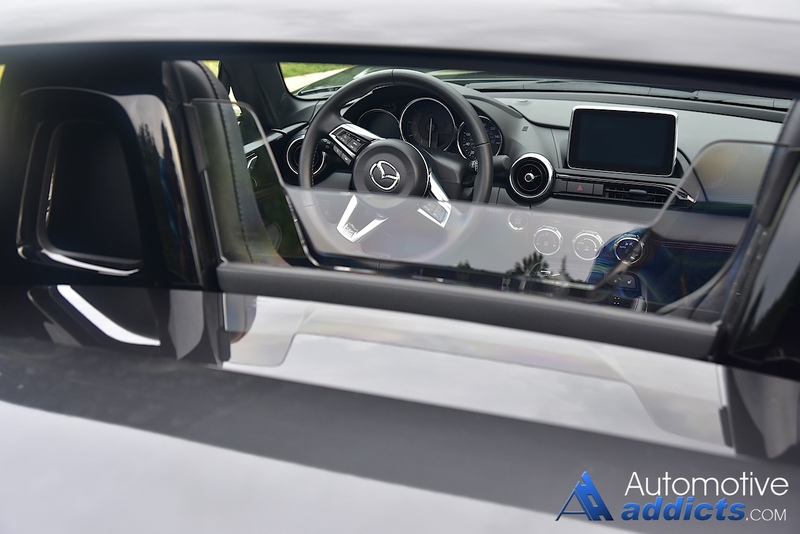 Motor Trend Selects 2015 Best Driver’s Car – Surprise!